Good Friday shindig with 3 live acts and our semi-regular Indie RnR disco till 2.30am! 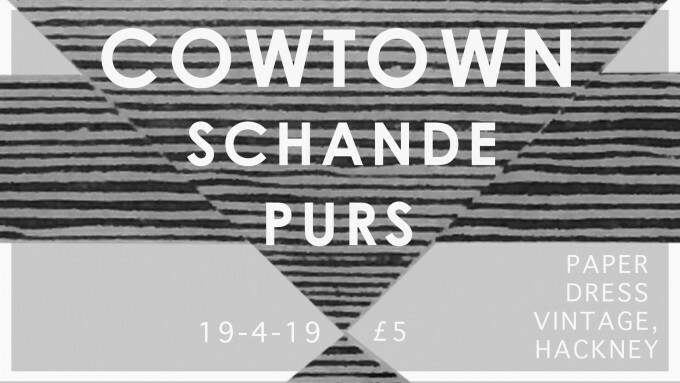 COWTOWN: Bringing the hot rock from Leeds- if you know, you know. If you don’t, ask somebody. PURS: Dreamboats makin’ dream rock. Get with it. Schande: A band that has no business making gig events for FB. Loveable scamps, really. + Don’t Pity Me presents a Glamorous Indie Rock n Roll Club Night (11pm – 2.30am) including the likes of: The Smiths / Orange Juice / The Cure / The Jesus & Mary Chain / Echo & The Bunnymen / The Teardrop Explodes / The Stone Roses / Primal Scream / Blur / Oasis / Supergrass / Pulp / The Strokes / Kings of Leon / Franz Ferdinand / Arctic Monkeys / The Rakes / We Are Scientists / The Maccabees / Foals / Bombay Bicycle Club / The Drums & Many More! !